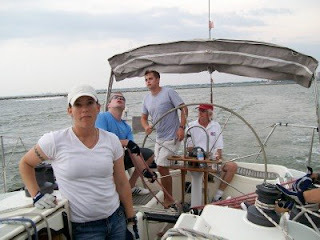 I’ve become quite the fair weather sailor in recent years but Bruce still hungers for the win. When our friend John invited him to join his crew for this year’s Race Week on Wet Express II, a Danish made Express 41, Bruce was interested. When John told him that he had a crew of “Rock Star” Annapolis boys lined up to sail the abbreviated schedule, Bruce was in! These boys came over from NAS Kingsville to help John win! 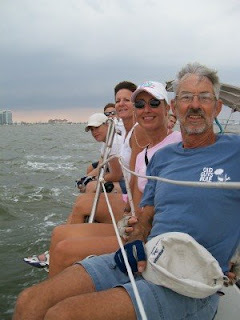 Bruce asked me and our friends from “Cute Shoes”, Jacquie and Steve to come with him to help fill out the crew. Now I knew that these guys were going to be a bit rowdy and would sail to the limit, but the winds were forecast to be manageable and the rain had stopped so I went along with it. Besides, these guys were “Rock Stars”…right? I had to see them in action. We had a good start, the boys were fussing around getting things in order so there was very little for Jacquie and I to do…we were boat fluff for this race. They boys were sailing aggressively at the start, taking another boat up and holding their ground on the rules. This was not just a Wednesday night race, it was the first race of the series. We came round the green can and hardened up to sail out of the gap in good position when suddenly, we came to a squishy but undeniable stop. Our gap has a bump that was apparently unbeknownst to the rock star. 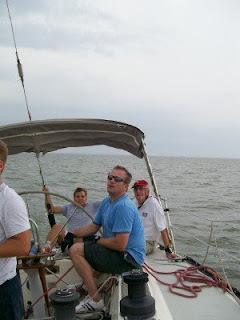 We watched as the other boats sailed lightly past us with looks of pity upon their faces. Oh the shame!!! Our rock stars began to try to maneuver the boat off the bump but it wasn’t until all of the other boats had sailed off towards the mark that we bounced off. Well, it was not over yet!! 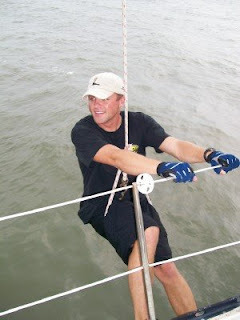 We re-set the sails and got into our positions on the rail and so forth to try to repair the damage. We were off…when the jib began to delaminate. It seems that when the rock star tried to backwind the jib to get us off of the bump, he did some damage to the jib. What else could go wrong!!?? Given the huge storm clouds building all around us with the lightening and thunder…we were afraid to ask out loud. 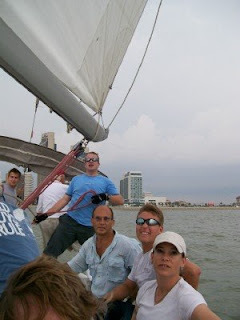 We brought down the sail and voted that we abandon the race. The 150 class boats were already passing us on their way back in. It was over. The rock stars had done us wrong. I had sailed on Wet Express for many years and this was the least successful ever. But, as they say… if you can’t say something nice… Well…nobody died! This was a very well written blog. I really felt like I was their and could appreciate your humor over the situation. I now know where I get my own excellent writing abilities.